would it be possible to use a very simple AC/DC converter with the Winmate DC-DC PSU? Yes, it's possible. Of course, depending on the components you have. Large Vin of Winmate DC-DC here comes fitty (18-28V). But the game is not worth the candle, I think. Let's wait for electrodacus' answer. Last edited by Ksanderash on Sun Mar 07, 2010 12:16 pm, edited 1 time in total. Yes this is the right answer thanks Ksanderash. Vicontik if the toroid transformer is good quality they are extremely efficient about 95% efficient you will probably use a 24V output and at this voltage you will have additional loss on the bridge rectifier if is a good one about 3 to 5% depending on load. The problem is that big toroid transformers 100W + are large and expensive and the advantage is that they are extremely efficient if they are good quality. I have purchased one 220W AC adapter from Liteon PA-1221-03 this has the 4 pin din connector necessary for my PSU and with the right pinout. It outputs 20V 11A so 220W this is enough to supply two of my PSU connected in parallel that will allow some people that will want a dedicated video card that can use up to 100W the remaining 120W for the system or use lots of HDD. This is purchased from eBay item number 350250601618 and it will cost 46.90$ US + shipping (world wide shipping 15$ what I payed ) if you live in US then shipping is free. It seems the guy have plenty of this and is a great purchase even for one PSU especially if you live in US. Great looking brick. It looks very nice, I ordered one for myself. Ksanderash and electrodacus, thank you for your replies. I will build that simple AC/DC converter. It will be a low cost project with parts from the recycling bin mostly. Will post a thread later and probably do some efficiency comparison with my PicoPSU + DA-2 and also with that LiteOn brick. The problem with High efficiency PSU is not affecting the Winmte DD-24AX since this will work even without load. I definitely can confirm this. The Winmate worked powering only the VFD110 (replacement) that i got from OrigenAE. And later didnt make a hiccup powering the entire rig. Wow this is very nice. For my system i'm overdone even with the gateway. It runs 24/7 and it is pretty cold to the touch. Assuming I am able to connect two of your winmates in parallel, is there any place I can find some kind of adapter or splitter so that I can connect one Liteon PA-1221-03 to both of the winmates? In order to connect them in parallel you just need a P4 to P4 cable connect the Liteon PA-1221-03 to one of the winmates ATX PSU and the the other one will be connected with the first one using the P4 to P4 cable. I'm not certain I get it. I understand the part about plugging the ac to dc unit into the black plug. The next part is a little confusing. I think you then need something that will plug into the white receptacle with the other end plugging into the other unit's black receptacle? Is that correct? Could you leave a link to a picture of such a cable so i could look at it. I think if I could see it I would understand. If you can do that, that is really neat. You have a modularly upgradeable PSU. When do you expect to start making the 220 watt Ac to DC unit available? The white receptacle will go to the other unit white receptacle it will look like this Link. I need to do some test to see how it works (probably in two weeks) and I will start to sell them as a kit that includes the necessary cable to connect them in parallel and the 220W AC adapter you will buy directly from eBay item number is 370332379526 or the from the guy I purchased eBay item number 350250601618 or search on eBay for "Alienware 220W"
Thanks. I had it wrong but that clarified it. As soon as you have the kit ready I will buy it. What if I bridged the two units through a shared 24 pin ATX to form a single shared rail for each of the different voltages? I have seen such a bridging cable before. That means there must be a history of some people doing that. It seems like it should work. 1. What if I did that in the place of of the 4 pin plug you are testing? Would it be safer or less safer to do that? 2. What if I did that in addition to the 4 pin plug you are testing? 1. It will be as safe as the first variant but in the end I will provide 20pin ATX Y cable I already purchased this eBay Item number 360214602674 you can do the same If you do not want to wait for me to provide. 2. the 4 pin plug is not necessary if you use the 20pin ATX cable it will be redundant. I'll wait. I would rather have something with your blessing. Though I sort of like the redundancy of using both. Could I link three of the winmates together and plug two of the power bricks into two of them - and get a 360 watt power supply? I do not think you will use more than two on a passive system. I need more than one. You are right that its unlikely that I would need three, but being able to expand if I need to - let's say I decide to add a video card - that is nice. I can start with 2 - if it looks like I only need one. Then I have an extra one. I like that flexibility. If we bridge two units together to the same load, would we not need load balancing resistors on at least one of the unit's outputs? Otherwise there might be an issue where the two units are trying to drive their outputs at slightly different output voltages (due to normal component variance). No you do not need balancing resistors the output is very similar no more than 0.5% difference and this will have almost no impact on how load is distributed between two or more parallel connected PSU it may be that one of the PSU will work harder but the difference will be less than 1 or 2% and this is not important. I already did tests and everything works fine. OK, that's good to know. Gigabyte is rumoured to be releasing a mini-ITX H55 too, in addition to what other manufacturers have already announced. Mini-ITX looks like it could make for an interesting platform for gaming. I came across this and though it might be of interest: Traco Power has a new AC/DC converter, the TXH series, which they claim has up to 93% efficiency, although the datasheet says 91% typical. The 240W version would probably work great with dual DC/DC converters, but obviously its not a plug and play solution. You would need to know how to wire one up safely - enclosure required. They also make the TOP-100 series which operates at about 90% efficiency. Yes this seems good AC/DC adapter but I will not recommend this unless you know what are you doing is safer just to use a brick type AC adapter also the price is probably similar. Does anyone know a 12v 80watt+ AC-Adapter that has lower then 10mv ripple on low loads? What low loads are you referring to? and if they are low why are you needing a 80W AC adapter? I want to build a HTPC with H55 mobo, Core i530 CPU, SSD and Soundcard. The ripple needs to be low because the cleaner power will improve the audio quality of the soundcard. I'm planning to use the new Creative X-Fi Titanium HD. I think 80watt is ideal for this setup. with 90% efficiency it can reach 15-20watt @ idle. But the problem is the ripple noise of all those AC-adapters. I can't find any comparisons of the ripple between AC-adapters. Take a look at the Winmate that Electrodacus on this forum sells. It has an extra layer of filtering. These units are designed for medical equipment. The specs are available online through a detailed engineering spec sheet. The best power supply you will get will be a battery no noise but if you can not use a battery then the next good thing will be my PSU . But the PSU is not be the most important factor in sound quality. Link unfortunately is a LGA775 motherboard not what you want but probably ASUS will be a good brand. So in conclusion the most important is sound card then motherboard and in the last place power supply. He want to use core i3 and a H55 motherboard is probably the most energy efficient platform you can use G41 is not energy efficient. Using core i3 and H55 will be able to get 15W idle or close that will probably not possible with G41. I will build that simple AC/DC converter. It will be a low cost project with parts from the recycling bin mostly. Will post a thread later and probably do some efficiency comparison with my PicoPSU + DA-2 and also with that LiteOn brick. I did already such test, and it seems, that transformer scheme has equal to power brick efficiency. I got the same watts, assuming that transformer has PF=0.65, and brick PF=0.9. The transformer is ..."semi-toroidal" Diode bridge 1000V/15A, capacitor 4700mkF/35V, rectified voltage is +28V w/o load, +24,5V when connected to Winmate board, and +23V under full 56W DC load by my compie. Nice. Here's my build. Still waiting for the Liteon brick so I haven't done any heavy testing yet. Diode bridge 8A (taken from a broken PSU), capacitor 6800mkF/50V, rectified voltage is +31V w/o load, +28V when connected to Winmate board. Initial results are not that impressive. In the BIOS with my file server (no disks connected) I got 50W with this and the Winmate, compared to 47W with an Antec 350W 80+ and 43W with PicoPSU and 120W brick. I'm really way over my head here. I know very little about power factor for example. Will do more testing when I have the Liteon to compare with. How you measure the power? 31V is a bit to much for Winmate for transformer application and good efficiency I will recommend 21 to 24V . 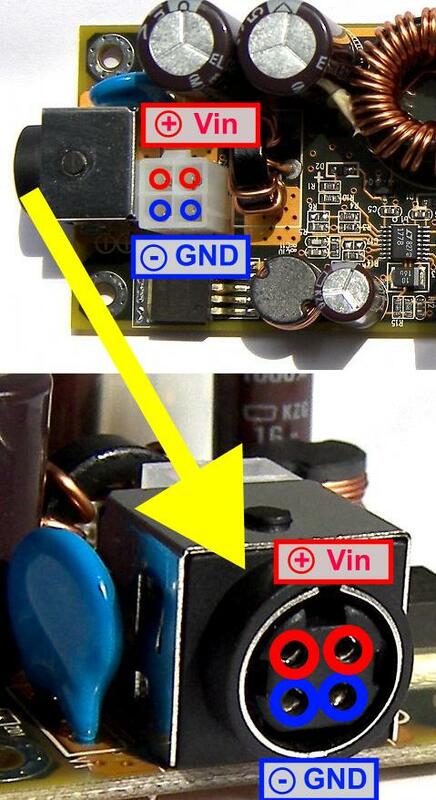 The lower the input voltage the better the efficiency but not less than 18V.